1. Hair styling tools like Blow dryers, Curling irons. Straightening irons operate at high temperature when used on the hair. This high temperature results in loss of moisture content in the hair. It is best to minimize the use of these tools. If used then at lower temperatures so as to minimize moisture loss. 2. Hair coloring products, and strong shampoos also result in hair moisture loss. No matter how herbal hair coloring products or shampoos are proclaimed to be, they still contain chemicals in some form or the other. The only natural hair coloring product known so far is henna – which again doesn’t suit everyone. All other colors obtained for hair color is due to some chemical composition. For shampoos, chemicals are added either to add fragrance or some smoothening agent to get rid of frizziness. Since everyone has different hair types and a particular hair product reacts differently on different people you never know what is the problem causing ingredient in your hair color or shampoo which can result in moisture loss. 3. Pollution also results in moisture loss. Though there is no cure for split ends apart from getting your hair trimmed at regular intervals there are many ways to prevent them. As hair grows from the roots, we constantly give attention to the roots and the hair ends are left ignored. They require attention as well. These are a few home-made remedies for spilt end prevention. These remedies will not get rid of already existing split ends but they will surely prevent hair from splitting. I have tried all of these myself and they work great. The best thing I like about these remedies is that all the materials used are available in your home and they don’t take much time. Many of these remedies you might already have known or tried or read somewhere, since they worked for me, I might as well share them with you. These are a few you would like to try out and find out which one suits you. Mix a small amount of castor oil/ olive oil / almond oil (whatever available) into the oil you regularly use (I use coconut oil). I generally add 2tbsps of castor oil to my coconut oil bottle (250 ml). If you wish to add all three of them you could do that as well. Mix equal proportions of these oils (1 teaspoon each) to the regular oil you use. Make sure you oil your hair-ends well. Generally hair ends that have split appear lightly colored than the rest of the hair. This mixture not only helps your hair grow but it prevents your hair ends from discoloring. Use this mixture to oil your hair atleast twice a week. Massage your hair & scalp with warm oil and wrap head with shower cap and leave for overnight or for 8-10 hours if you have time. Wash.
Alternatively, take ½ cup oil in ½ cup boiling water in a bottle and close it tightly. Shake vigorously. Massage this mixture thoroughly into your hair from root to tip and cover with shower cap. Leave for ½ hour, then wash. Just be careful with your hands and head as the water is hot. A papaya pack is a great natural care of hair split ends. Take 2 big slices (2 small/medium slices) of ripe papaya. 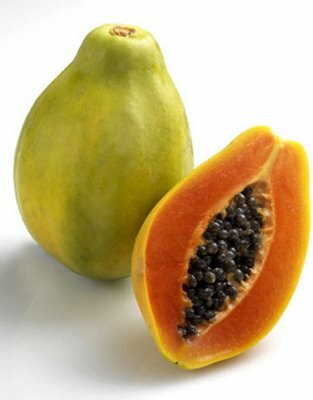 Remove the skin and the seeds of the ripe papaya and blend it in a blender. Add to it half a cup of yogurt and apply thoroughly to your scalp and hair. Wash after 30 minutes with warm water. If you don’t have papaya you can used a ripe banana instead.1 ripe banana would do. Grind 1Tbsp of methi (fenugreek) seeds with half a cup of urad dal to a coarse powder. Add half a cup of yogurt and mix well. Apply generously all over the scalp. Apply thoroughly to your scalp and hair. Wash after 2-3 hours with warm water. Take 4 cups warm water and add 1 tbsp of honey into it and mix well. After you are done with shampoo and conditioning and rinsing, apply this mixture all through your hair. Do not rinse again. This mixture not only makes your hair soft and gives a shine to them; it also retains the moisture content in your hair so that your hair does not look dry or frizzy. This is a home-made leave in serum/conditioner for your hair. You get many leave in creams/conditioners/serums in market these days like L’oreal Professional, Garnier, Pantene (though I haven’t tried any of these) which are quite pricey and moreover there is no surety whether that would work on the hair or not. But this one surely works and I don’t think there could be anything more economical than thisJ. I use this one regularly. Always use lukewarm water to wash your hair. Do not use hot water. Hot water depletes the moisture content of the hair. It is always better to keep the split ends trimmed; otherwise, they may split further up the hair. I hope you find these remedies useful. If you have any other remedy that I have missed out please share them as well. I think the tips are great and I’ll be looking forward to try them on this weekend for sure as most of the things are easily available at home. It was so nice and honest of you to write and recommend only what you have personally tried and tested. Thank you so much for that. In fact I don’t have split ends **touch wood**, but I will recommend these tips to my friends/family. Great Tips Anoma. I follow few of your DIY tips regularly (twice in a week).It works very well on my hair too. I used to mix castor/sesame/coconut oil and heat them for few seconds.I will apply the oil using the cotton..which gets absorbed in to the roots easily which is better than using hands.Got this tip from a beautician. In the morning, I soak the towel in to the hotwater and squeeze the extra water and wrap it around the head.I will do this repetition for 2 -3 times. Finally leave it on head for 5 mins – this will make your hair to sustain the moistureness. Anoma, hair serum tip is interesting.Im going to try this.I love to follow DIY tips for my skin and hair. My DIY hair serum is – rub 2 or 3 drops of “extra virgin olive oil” and apply it on the ends of hair.It keeps me away from frizziness. Thanks for sharing the olive oil tip. But wouldn’t olive oil on the tips make the ends look oily from the rest of the hair? Do u apply it on wet or dry hair? and how much oil? btw, which brand of olive oil do u use? P.S. Your name is beautiful. What does it mean? to be honest, ur tips are very inspiring…but for some weird reason, i am too lazy to take care of my hair and feet ….my mom really pesters me to take gud care of my hair…if tat doesnt work, she really drags me and starts applying something on my head…. Nice article ! I am always skeptical of using honey on my hair. From my childhood I have heard my mom and many elders say that honey makes your hair gray !!! I have never had the guts to try it on my hair even though so many recommend it. Has honey worked for you ? wow Amona! Hair serum idea seems great. I have to try this…I use castor and olive with coconut oil…. have tried banana too but it just got stuck to my hair and took 2-3 days to wash off completely 🙁 but I would like to try the papaya one now..
@Jane: Yes Honey has worked of me.Haven;t heard abt honey turning your hair gray.Hearing this for the first time. @dvja: Yes i agree many of these home remedies stink a lot. But its worth the results u get after bearing with it for half an hour. @ utsav: didn’t know abt face moisturiser, will try that out.Thanks for sharing the tip. I’m facing this hair problem, I hate it! It’s because I always straighten my hair, I have to do it because I really don’t like my hair in her natural way. And I always use hot water, I’m always so cold! I know I should lower the temperature.. I’ll really do it now. I want to try your remedy number one but I normally don’t use any oil, would that matter? Can I just follow the ingredients even though I don’t use it normally? This is my ritual: washing with Biosilk shampoo on Saturday, it takes about 20 hours for my hair to get dry. On Sunday, I use a little bit of heat protector and straighten my hair. I’m striving to do this once a week but mostly I wash my hair about two times a week and sometimes I use the straightener two times a week. Besides shampoo and heat protector I don’t use any other hair products, I even never use conditioner, my hair feels so rough when I use it. Should I use conditioner anyway? If you ar not oiling your hair prewash, I suggest that you use a good protein conditioner. I am not sure what is available with you there so you need to do a bit of conditioner hunt yourself. I used to have splitends before but now sice I get my hair trimmed every 2 months, I don’t face this problem anymore. I generally like to condition my hair with beer or milk once in a while but I do oil my hair pre wash. I apply oilive oil overnight and then wash my hair in the morning. Also, as Anoma suggested massage the oil thoroughly into your hair from root to tip. We generally tend to oil only the roots but forget the tips. I have waist long thick black hair and i maintain it… its very easy actually… take equal amount of coconut oil, castor oil, olive oil, sesame oil and mustard oil. Warm it in a pan or kadai add two almonds to his mixture and apply this to your hair from scalp to your hair tips. Leave it over night and wash it of using shampoo. Girls avoid using dove after you have applied this mixture as it is very mild and it cannot remove oil and may lead to dandruff problems. And even i do have a simple and no time consuming remedy for split ends i.e have abt a cup of mausambi juice and just apply it to lower portion of ur hair (to split ends) and leave for abt 1\2 hour and wash with light warm water. Applying aloevera before shower works wonder in repairing split ends. I’m travel lot in sun lite and facing a problem of splits ends and hair loosing, but its on the top of my head. my hair got rough and not a equal lenth. cant trim the spilts ends coz its on top of my head plz suggest me wat to do? now im using sunsilk pink shapoo and conditioner and coconut oil (parachute) suggest me wat product to use for better results.